*In January 2019, Phoenix acquired Bright Light Systems. The project below references the previous generation of Phoenix’s Highland Series and the LIT System. A. Harvey Marine Base is a long established and leading local supplier of logistic support services to the offshore oil and gas and marine industries. 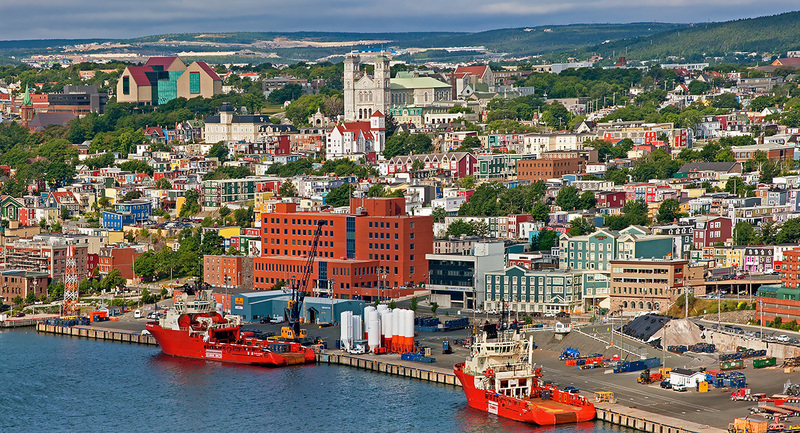 The Marine Base is situated at the east-end of Water Street in St. John’s, Newfoundland, strategically located as the nearest point to offshore Newfoundland, and the Grand Banks. Historically, the Marine Base has used 1000 watt high pressure sodium lights for illuminating the wharf and adjacent yard during night-time operations. The lighting is controlled through use of circuit breakers or a photoelectric controller and when the port is inactive, these lights are still burning at 100%. Many of these lights are also left on during the day and inevitably burn out requiring frequent lamp replacement in harsh conditions. In addition, high energy rates for the island make the lighting expensive and costly. Replace 1000w HPS flood lights with BLS NOVA FL LED Floods along with the Bright Light Management System (BLMS) wireless controls. The NOVA FL consumes just 290 watts and delivers over 32,500 lumens with over 7 different optical packages for optimal light coverage. The crisp, brilliant white light offers improved color recognition for security cameras and better night-time visibility for port personnel. Integrated BLMS controls and motion sensors achieve up to 30% in additional energy savings. Adjustable glare shields eliminate light pollution for the surrounding residential community. A 100,000 hour L 80lifetime reduces maintenance costs by $3,181 annually.